last night yesterday was a bit rough. as the day progressed, i felt progressively misunderstood. not by any particular person, and about nothing monumental, but the misunderstandings seemed to pile up as in one of mayhem's little tricks. while many people would shrug it off, i've always had issues with feeling misunderstood - i have a possibly unhealthy deep desire to be understood correctly, and i push to make that happen. scattered, stilted or short conversations (via email, text or hurried phone calls) have a lot to do with misunderstanding. in this world of quick communication, texting, facebook chats and instant messaging, is it any wonder that i, along with so many other people, feel misunderstood? is it because the art of listening has been suppressed somehow? i can't believe that it has been lost altogether, but i feel the results of some suppression of communication. i'm not at all surprised that i chose the word "listen" as my oneword for 2011. it's clearly something at which i need to work harder. especially when it comes to listening to God's voice. it's why i got my first and only tattoo. 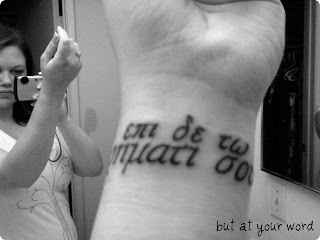 the greek words epi de to remati sou, which are translated "but at your word" and come from luke 5:5.